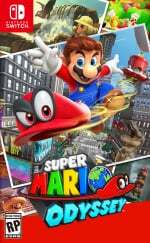 Super Mario Odyssey is now only a little over two weeks away, and plenty will be hoping that it delivers a memorable leap forward for the franchise. Early indications are certainly positive, and Nintendo's been doing an impressive job of marketing the upcoming sandbox platformer. The latest video is probably the best yet, however. It's a live action "Jump Up, Super Star" musical, taking the song that grabbed us all during E3 and throwing it into some fantastic production values. It's one of the best Nintendo commercials / videos we've seen in quite some time. Best Nintendo promo video ever! This has to be one of the catchiest tunes I've heard in years. I already find it caught in my head quite often and the game isn't even out yet. I've been doing my best to avoid most stuff about this game, including music. Saving this page for later! Definitely the best Musical out there. If only it could last for a bit longer. Edit: And here I am to watch it again.. And again.. And again.. again! Can't wait until SMO is out. EDIT: I wanted to write a longer comment but i can’t stop watching the video.. So i’ll go watch it another 30 times ! That was great. Very Nintendo. Not going to lie. I cried a little. I don’t think I’ve been this hyped for a game since Smash Bros Brawl. I’m really impressed by the staging and choreography! I love this. It has all the cheesy Nintendo charm and humor of many other things they do. @Kalmaro its not like its a spoiler ironically its just music and dance with release date mainly. @edgedino Would you believe that I've managed to mostly avoid all music for the game? I remember hearing some of it once during the direct but I forgot it already, and I'm doing my best to keep from remembering! So far so good. @Kalmaro atleast its not as catchy as some splatoon music that stuff just can't be forgotten no matter how hard you try, i still got lyrics from the original splatoon commercials going through my head. @edgedino The music in game isn't too shabby either. The final boss songs were pretty epic this time around. @Kalmaro its to bad i had to miss splatoon 2 this time around. @Kalmaro i have limited funds so have to be p[icky on which games for now. Fantastic! Can't wait for this game. I just kept waiting for Micheal to jump out. Yeeeeeaaah, this is gonna be good! Played the demo at best buy and I really think this is going to be a special game. 1. Mario still creeps me out in a crowd of regularly proportioned humans. 2. Am I the ONLY one who finds this song cheesy, poorly written, and obnoxious? I am beyond sick of it. On another note, I haven't seen anyone say this, but I think "Odyssey" is not just a fun word for Mario's big adventure. THEORY: I think it's based on Homer's Odyssey. Paulina is either Calypso (who imprisoned Odysseus) or a siren (thus the singing) trying to keep him from returning to his wife, Peach. Meanwhile, thinking he's gone for good (like Odysseus) other suiters (Bowser) come to try to win his bride (Peach) but she stays faithful while he journeys back to her. at the end Mario will slay Bowser just like Odysseus slew the suitors. you heard it here first. 20 years from now a "developer interview" will tell us how the islands were based on parts of that epic poem. Why can't I speed up time?! Also, fantastic promo. It was Swing Jazz music. That music was so popular during 20's era. Wow!, Awesome! !, well, I adore musical (well, not much, XD), but really it is great effort for show more of this fabulous game. Well, only 2 weeks more! This put a huge smile on my face when I first saw it, I laughed when Mario and the New Donk citizens started dancing. Really hope we get the same commercial in the Netherlands. I feel like a kid again!! I’m glad they fixed how the humans look. The streets now look a lot less empty. Happy to see this kind of jumpy spirit in advertisement. My jam! Why can't the 27th hurry up and get here already! I was smiling the whole time while watching it. @justin233 Me too man, my level of hype is beyond BOTW levels. Nintendo share price did a Jump Up by 1.5% as result of this video! @SLIGEACH_EIRE Can you make a list of what you do like? Then we can get you a nice Christmas present. @cfgk24 But I liked that ad. It was really good. When I say I don't like musicals, I mean that I couldn't sit through a movie musical like Chicago, Grease, Mamma Mia or whatever. That trailer wasn't really a musical. @SLIGEACH_EIRE Lol, I can't cope with Opera. . .
Was anyone else reminded of that old LoZ: ALttP trailer? This is a perfect example when Nintendo chooses to go all out the competition pails. This is super cringy, as is the song. At least it shows some in-game footage! Well Now, that was something! Superb trailer, if that doesn't put a smile on your face I don't know what will. "I like how everyone seems to love this video and the game overall. :] Such positivity, how nice for a change instead of the usual childish name-calling and swearing that usually permeate YouTube vids like this." Just two weeks to go and they better be stock piling those switches! Does a pretty impressive job of showing off the game while also demonstrating the Switch's various features (motion controls, two player, portable mode, etc) without beating you over the head with it (i.e., there's not just a voice over saying "you can even take it on the go!" or whatever). If only there was an Oscar for best original song on a video game... Catchy as hell. That was incredible! I love all the old school live-action commercials Nintendo used to do, especially the Animal Crossing ones, so this makes me happy. @Giygas_95 If your going to tell me there is a longer version but isn't. Don't bother talking about it as I don't like it when people do that, it's annoying.